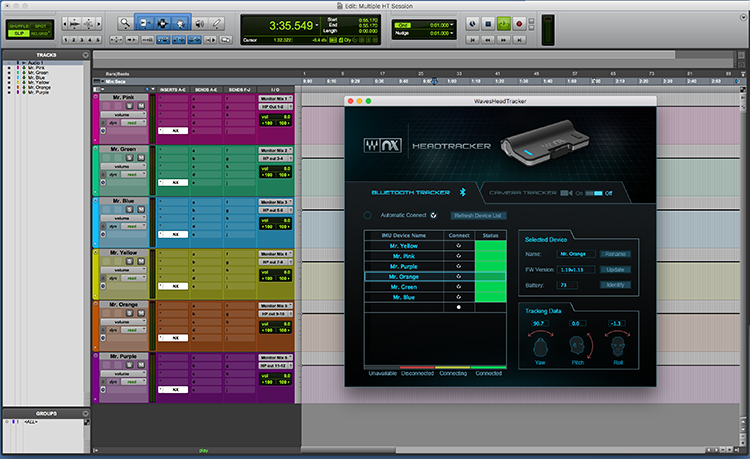 In the example below, six personalized headphone monitor mixes are sent to six musicians, each with an Nx Head Tracker on his or her headphones. To create this setup, each headphone must be connected to a dedicated headphone output, which is patched to a dedicated DAW channel. 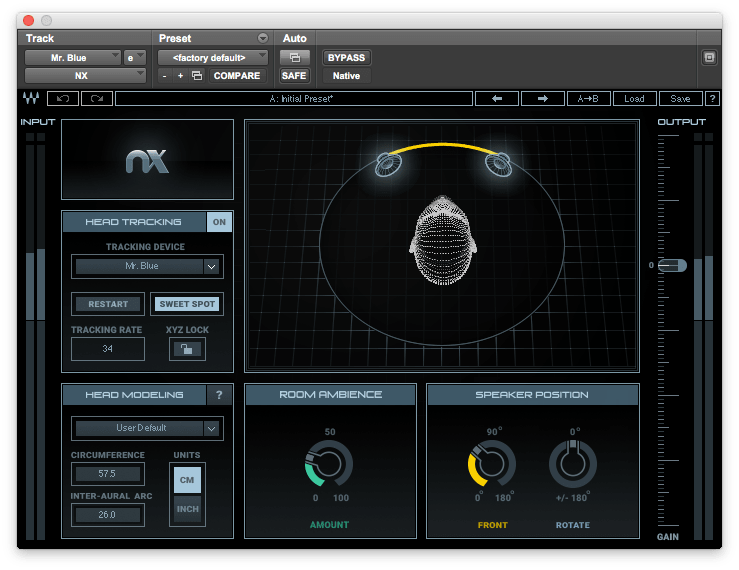 Every DAW channel must, in turn, have an instance of the Waves Nx Virtual Mix Room plugin. 1. Create an auxiliary buss for each musician’s headphone monitor mix, and route all the busses to individual headphone outs. 2. Insert an instance of the Nx Virtual Mix Room plugin on each of these Nx busses. 3. If the WavesHeadTracker application is not already open, open it now. 4. Power up the six Nx Head Trackers. They will appear in the Tracking Device list on the Nx Virtual Mix Room plugin interface. Mac: The Nx Head Trackers are detected automatically and added to the list of devices in the WavesHeadTracker application. Check the “Connect” checkbox. Windows: Click the “Open Bluetooth Settings” button and pair the six Nx Head Trackers. The Nx Head Trackers will be detected automatically and added to the list of devices in the WavesHeadTracker application. Check the “Connect” checkbox. 6. When an Nx Head Tracker device is first assigned, its default name will be “Nx Tracker.” To avoid confusion, we suggest you rename the device in the Device List to match the aux channel name in the DAW. In this example, we named (and color-coded) the devices “Mr. Pink,” “Mr. Orange,” “Mr. Blue,” and so forth. 7. For each instance of the Nx Virtual Mix Room plugin, select the headphone output that will receive this aux buss feed. Selection is made in the drop-down menu in the Tracking Device section. 8. 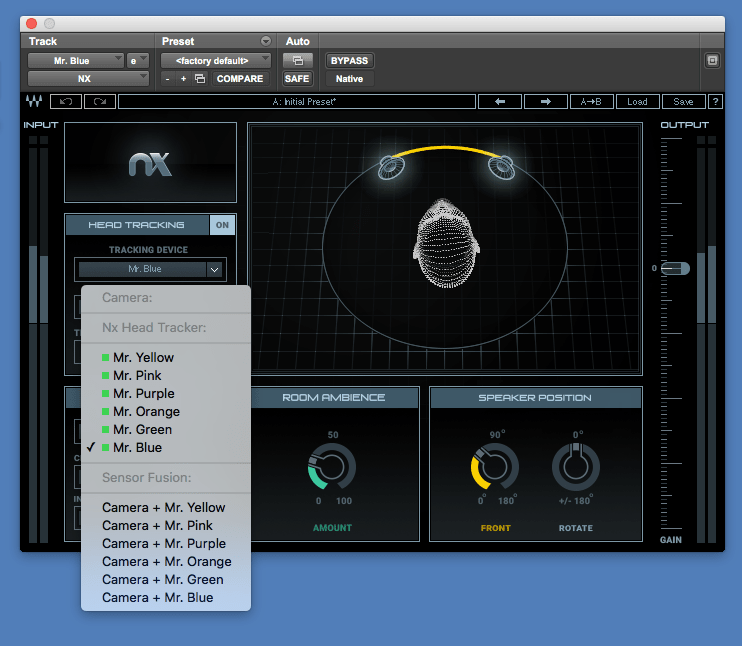 To calibrate the Nx Head Tracker for each artist, click “Sweet Spot,” one device at time. 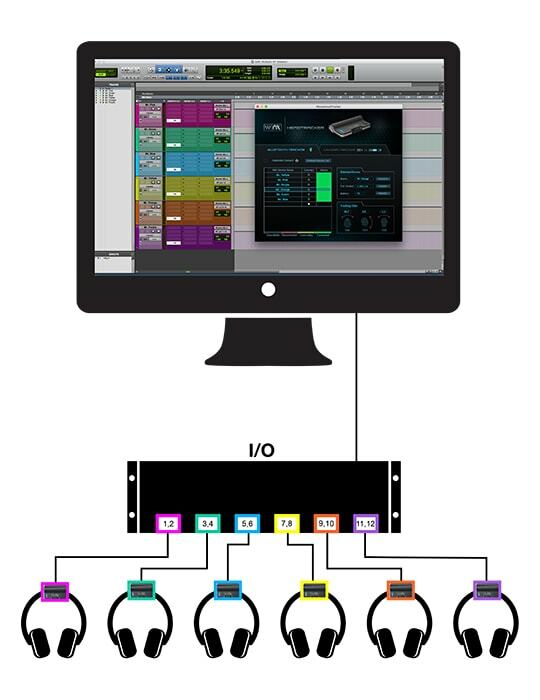 In this example, we sent personal monitor feed to six musicians, each receiving an individual instance of the Nx Virtual Mix Room plugin. 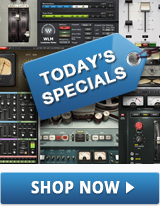 You may also choose to send an Nx feed to the recording engineer. This is done in the same way, with the Nx Virtual Mix Room plugin inserted either on an aux buss or on the master track.